Half the distance, half the glory? 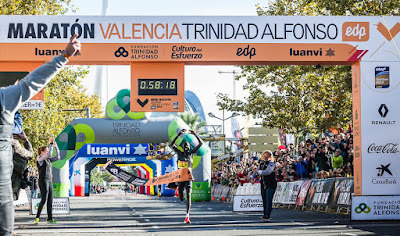 Yesterday the world half marathon record was broken in Valencia (in perfect sunny conditions - unlike the scenes at Venice marathon, where it looked for all the world like the course had accidentally gone down, rather than across, a canal ...) Yet who has read this morning about Abraham Kiptum's fantastic time? Aside from specialist running titles, I've yet to see something in print or online. The picture above may be my legs, but my first cross country race of this season didn't so much as skirt around a tiny patch of mud. In fact it was almost unnerving: 18 degrees, bright sunshine and running wearing shades? Most peculiar. 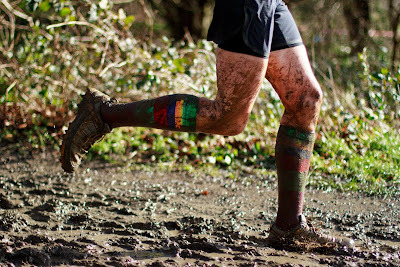 Mind you, Richmond Park - a frequent venue on the Surrey circuit - is rarely a mudfest. Must be all the deer sweeping up beforehand to make it tidy for us. So much running this weekend I don't know where to begin. Well, firstly with the disclaimer that none of it was mine (none of the impressive kind, anyway). 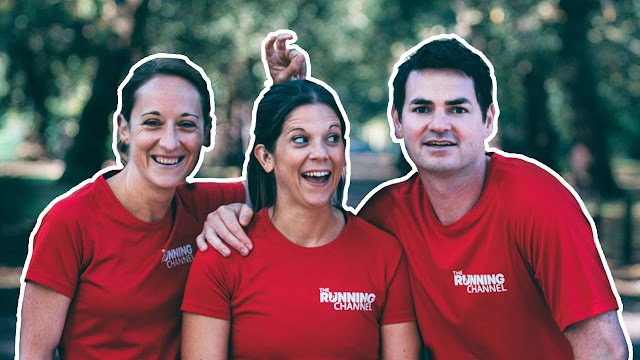 There were marathons in Bournemouth, Chester and Chicago, halves in Kingston and Cardiff - and that's just the ones I had friends taking part in. Mo Farah will no doubt have got a massive cheque for his efforts, so my particular kudos goes to Tracy Barlow for once again being top British lady at the Cardiff half, to Melissah Gibson for smashing her PB in Chester with an awesome 2 hrs 51mins, and to Sarah Dudgeon who didn't have the race she probably wanted but gritted her teeth and did it anyway in Chicago - to be honest, those kinds of races are the ones that you really deserve the praise for. I very much liked this Tweet from Alexi Pappas (if you don't know who she is, look her up - she rocks) which summarises her own debut nicely. Who needs Monday mornings anyway? Now, the problem with this freelance lark is that you lose track of days. Well, turns out I do, anyway. Is it Monday? I hadn’t noticed. Etc. So apologies for both lateness and brevity of this post. In truth my weekend running was nothing to write home (or blog) about. Still recovering from this nasty sinusitis that seems to have infected my whole family, I did more pootling than running. However, it did include my clubs fantastic inaugural quarter marathon trail race - a glorious loop of Wimbledon Common. It was an unusual and thoroughly enjoyable experience to truly take a race easy and just have fun, including halfway high fives from my kids (aka medal-giving marshals) and also to catch up with Gill - BTL regular, friend and all-round superstar runner - who also was second lady in the race. Actually, I had a bit of a dilemma when I saw her and my friend and co-captain Julia neck and neck in the lead on the way round - I wanted both of them to win!